*Hats and T-Shirts - anywhere in the USA. OTHER COUNTRIES FIRST CLASS MAIL - please inquire. 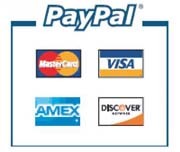 Credit Card payments are invoiced and paid thru PayPal. You don’t need to have or establish a PayPal account and you don’t need to give me a credit card number. Just let me know you’d like to pay with a credit card and I’ll send you a PayPal invoice. No hassle, no risk, and no fees for you.